Oh my where has the year gone. It seems like we just finished last years presents. We have been so busy here at the North Pole that we have not had time to update here. There is LOTS going on, LOTS of new toys to be made, and LOTS of new kids on the nice list. A huge high five to all the nice kids. We will be updating here often to let you know all the action from now till the big day. So stay tuned!! 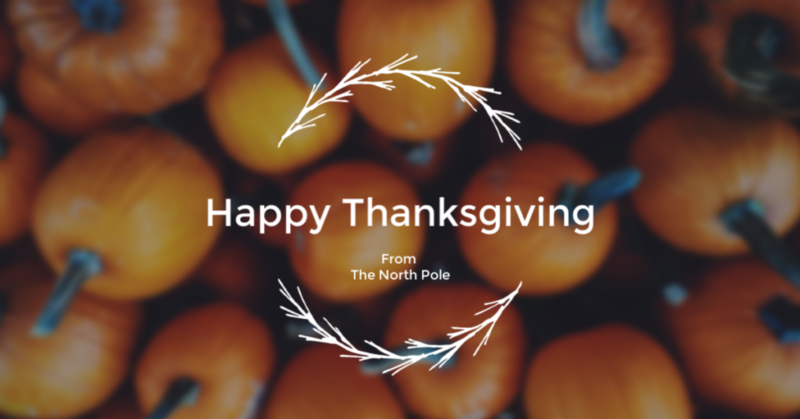 From everyone here at the North Pole; we are wishing you a very Happy Thanksgiving. We hope that you have a day filled with loved ones and are able to celebrate all the things that you are grateful for. As a side note, it is a very special day for us. Santa deviates from cookies to eat pie. While he likes the traditional pumpkin. His favorite is a triple berry pie that Mrs Sprinkles has worked on for over 100 years to perfect. We are so excited here at the North Pole. The next version of the list was delivered to us and it had a HUGE surprise. There are so many children on the nice list this year. It seems that kids all over the world have been working hard to be nice and good. We are so proud of all of the children this year!! 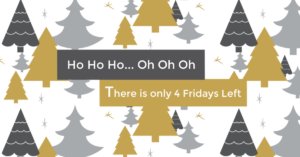 Us elves will be working over time to get all ready for the big day next week! Not sure which list you are on? There is still some time to make sure that you are on the nice list. Well we, all the elves here at the North Pole, have survived another wonderful Halloween. It was a fun night filled with all kinds of treats, candy, and tricks. As it turns out, trying to wash the blue coloring from our skin has proved to be a bit harder to remove then we thought. While it is November, we are all still looking a little more Smurf-like then Elf-Like. But that is okay. 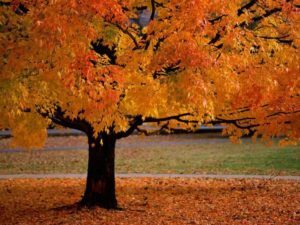 What does November mean for us here at the North Pole? It means the official count till Christmas. We are in the home stretch here and rolling out the final toys. From here on out, we are working over time, eating extra cookies to keep up our energy, and rushing to get everything done just in time. As you have read this year we are having a record number of kids on the Good List. And that number keeps going up daily. Keep up all the great work and all the nice deeds that you are up to. Did you know that the North Pole celebrates Halloween too?? Oh yes, it is one of the few holidays that we take off. And something that we look forward to every year. You might be wondering what Elves do for Halloween. Well we do all the typical stuff that everyone else does. We decorate with bats and spiders. We go trick or treating for candy (and sometimes cookies). We play tricks on each other. Just have a great day full of fun and cheer. But the best part about Halloween for us is, getting to get dressed up. Now this is not like one or two of us get in the spirit. Oh no, that would be to easy. We ALL get dressed up. All 645 of us elves (as well as Santa and Mrs Claus). Then to top it all off, we all dress in the same theme. Try getting 645 elves to agree on a theme. It is normally pretty hard. This year though, we all knew what we were wanting to be. Are you ready for it? This year, all the elves are going to be SMURFS!! 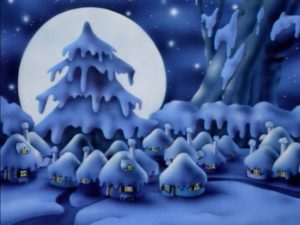 That is right, the North Pole is going to be changing into Smurf Village for the night. It is going to be so much fun. We are really excited and have already started to work on transforming the whole town, and really working on our costumes. What are all of you boys and girls going to be? There are only 75 days left till Christmas!!! Now I know that is not the big news that you are hoping to read about. But for those of us up here, it is a very big deal. We are in the home stretch and coming in close to the big day. Less then three months for us to finish up everything that we need to do. And the reindeer are no where near in shape or ready to take flight. Okay but the big news that you all are waiting for……. we have a new record for the amount of kids on the nice list!!! That is right, this year is a new record high. All of you boys and girls are being so good this year. And we are more then proud of you all. There are lots of you that worked really hard this year to be on the nice, and it really paid off. Last year was a great year for everyone, but this year you guys topped it!!! Everyone should be so proud of themselves. Now the work does not stop now. All you boys and girl need to keep up the good work, so you can stay on the nice list. And if you are worried that you might be on the other list, there is still a little bit of time to move over. But you need to act fast, cause Santa will be checking that list twice soon. We are down to counting on two hand and one foot!!!! 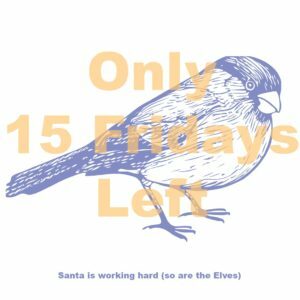 Only 15 Friday’s left till the Big Day! Are you as excited as we are here at the North Pole. Now we know that many people are looking forward to all the holidays in between now and Christmas. 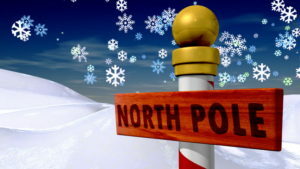 But here at the North Pole all we can think about from here on out, is it is almost Christmas Eve!! Then Christmas. Things are starting to get so busy and bustling that Miss Mary Sprinkles had to fine an assistant in the kitchen for her. We are always out of hot cocoa. And there is nothing that will make an elf more steamed then going for a nice hot cup of cocoa only to find out that the pot is empty. So now we have Miss Sunshine herself here and her only job is to make sure to keep the hot cocoa coming. Thank goodness, things were starting to get a bit dicey for a while. And on that note, I need to go get a refill and back to the toy workshop. So much to do, and so little time. Woo Hoo Only 15 Friday’s Left!! 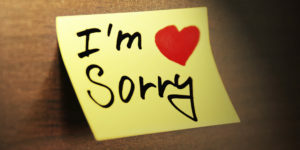 This is my public apology to Mrs Mary Sprinkles. Your new found recipes are wonderful and I am so happy to be trying new things. You are a wonderful chef and should be very proud of the food that you are able to cook for all of us elves. I know that Santa and Mrs Claus are happy to be eating more then cookies and hot cocoa. I am publicly taking back what I said about you. We are very lucky to have you as our head kitchen elf. We are in full countdown mode up here at the North Pole. While it may only be July, and it is the last thing on everyone’s (not elf, Santa, or reindeer related) mind. Here at that North Pole, we are ramping up into our busy season and what a season it is shaping up to be. 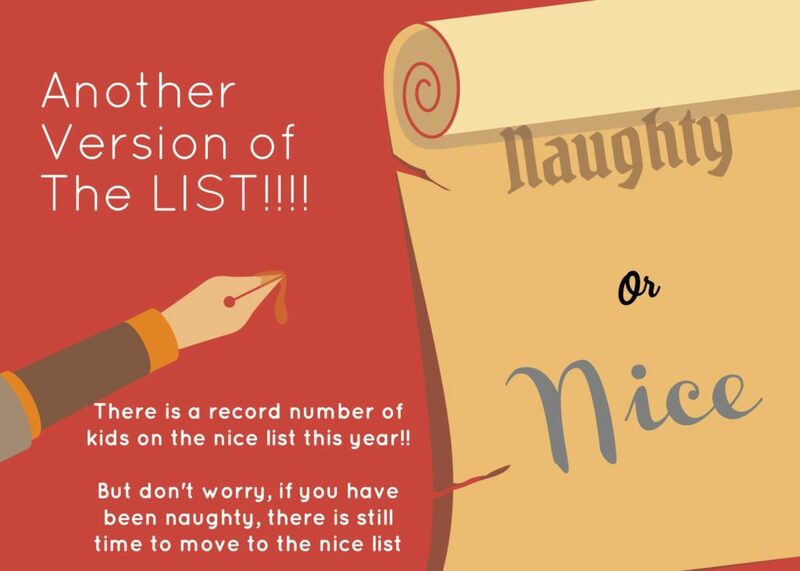 It seems that lots of you boys and girls are starting to think about which list you are on… naughty or nice. And many of you are changing your ways to get moved over to the nice list. I want to be the first on to let you know that it is certainly is. With record breaking numbers, our list is greatly moving from the naughty list to the nice side. This is amazing news. Now just remember that with as easy as it is to move to the nice list, it is just as easy to move back to the naughty side. So keep up the good deeds. There is lots of news from the kitchen. It seems that Mrs Mary Sprinkles (our head kitchen elf) has discovered Pinterest. Which is good, since we will be eating more then just a few cookies. But she seems to now think that she is a gourmet chef, and is whipping up duck tartare and other “fancy” foods. If you are reading this… Mary please stop. Also, we are running short on Cocoa! If anyone wants to ship some up here, that would be lovely. It will be a while before Santa can go out to buy some. Oh my oh my. That seems to be all of the news up here. The countdown is on!! 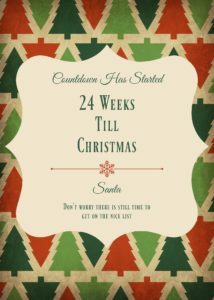 Less then half of the year left with only 24 weeks till the big day! Here at the North Pole, July marks a turning point for us. It is like going up and up and up on a rollercoaster, then July is that tipping point where we starting rushing downhill. From here till the big day, time seems to speed up. Christmas feels like it is coming at us faster and faster. Does it feel that way to you guys. 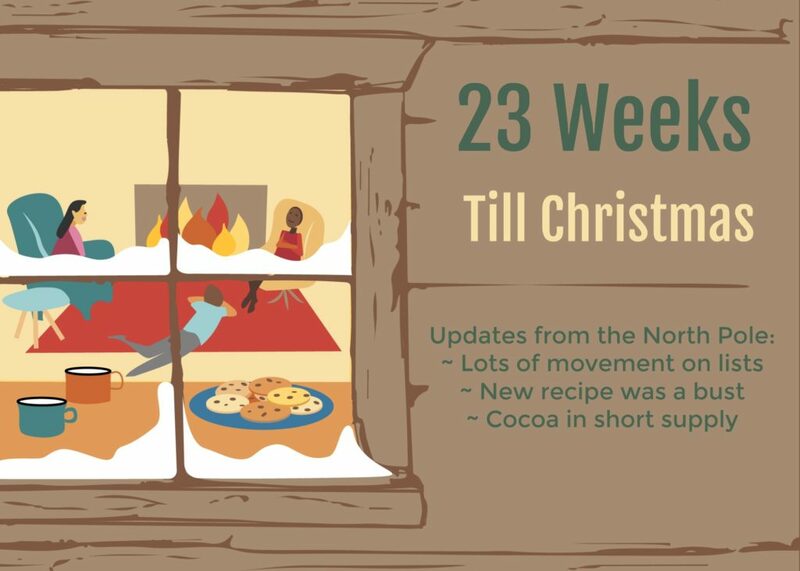 Okay some updates from the North Pole: Mary Sprinkles (our kitchen elf) has had to switch us all back to cocoa. Some of the elves felt that drinking coffee was making us a bit… cranky. And after being moved back to cocoa, I think that they were right. (Personally it did not affect me that way). Mrs Claus is busy making a new recipe for dessert this winter. It is top secret and she is not letting anyone know what it will be. (Be sure to check back on the recipe section for when she announces it). And the reindeer seemed to have gained some weight since last Christmas so they are busy working out and getting back into flying shape this summer. I think that covers all of our news. Keep being nice, and those that have been a bit naughty; there is still plenty of time to get moved to the nice list.